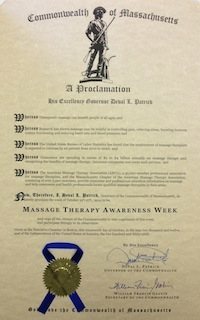 On Friday, October 19, 2012 Governor Deval Patrick proclaimed the week of October 21-27, 2012 to be Massage Therapy Awareness Week in Massachusetts. You can read the full text of the official Proclamation below the video. And urge all citizens of the Commonwealth to take cognizance of this event and participate fittingly in its observance. Given at the Executive Chamber in Boston, this nineteenth day of October, in the year two thousand and twelve, and of the Independence of the United States of America, the two hundred and thirty-sixth.